This is a simple trapunto project. 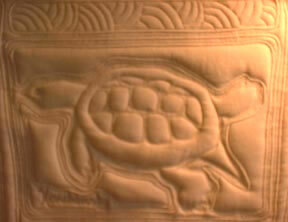 Click on the turtle drawing to get the image to print. Download Turtle drawing above. Print it out. Enlarge it to 10 1/2 inches long. Regular muslin works well here. Do not preshrink it. Trace or draw the image on your fabric. Place a piece of cotton batting behind the fabric and secure the two layers together with pins. Then thread the machine with the Wash-a-Way thread in the needle and regular thread in the bobbin. Sew around the image edges. Cut away any batting outside the stitching line. This will give you an extra layer of batting in your quilt sandwich. Construct your quilt in your normal fashion. After you have put all your blocks (if you want more than one image in your quilt) together and quilted the top with the complete layer of batting and backing. When you are finished quilting, and have put on the binding, then spray the quilt top with water to dissolve the Wash-a-Way. The shrinking of the muslin will help bring out the relief effect of the trapunto.